ECDPM. 2014. ECDPM Work Plan 2015-2016. Maastricht: ECDPM. Please note that this is ECDPM’s Work Plan for 2015-2016 (published November 2014). 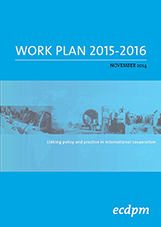 ECDPM’s Work Plan for 2016 (published November 2015) can be found at http://ecdpm.org/workplan2016. The Centre is now into the second half of its current Strategic Plan period that started in 2012. A Mid-Term Review of the Strategy was conducted in 2014, which confirmed that by and large ECDPM was on track to deliver on this Strategy, although a more concerted effort was required in a few areas. Broadly speaking therefore, over the remaining two years of the Strategy ECDPM expects to consolidate the progress achieved and further strengthen the focus and relevance of our work as we confront new challenges. This Work Plan therefore provides for considerable continuity in our work but also proposes three important changes with respect to the previous plan: (a) a continuing effort to increase ECDPM’s presence in Africa, (b) further refinement to the stronger emphasis on knowledge management and communication made in the last two years, and (c) a more concerted effort to bring together our work around the four Themes of the Strategy. These changes are explained in the following pages. Overall our intention is to maintain ECDPM’s strong track record as an independent broker and contributor to strengthening cooperation and relations between Europe, its Member States and institutions, and the countries and institutions of Africa, the Caribbean and the Pacific (ACP). The Strategic Plan, which has shown its worth by guiding our work over the past three years, was based on an external evaluation carried out by a team of experts from Africa and Europe. The evaluation concluded that ECDPM had become well established as a centre of excellence that achieves substantial outcomes and impacts in relation to EU-ACP policy, cooperation and related capacities. The Centre remains committed to building on that legacy. In 2015 we will prepare our next Strategy for 2017-2021, which, as in the past, will include another external evaluation process.